Welcome to the December issue of the Learning Center Newsletter. As this year and millennium draw to an end, I would like to wish you all a happy holiday season and best wishes for 2001. November was a busy month for conferences. I was at the NWCA National Conference in Baltimore and the CRLA Annual Conference in Reno. Many LCN readers came by and introduced themselves. Some suggested excellent ideas for improving the newsletter. Others told me that they enjoy reading the LCN and look forward to receiving it every month. I would like to thank all of those who stopped by. Your support and encouragement are greatly appreciated. I had a meeting with Frank Christ during the CRLA conference. Frank has been a great supporter of the newsletter since it started, and it was great to finally meet him in person. During the meeting Frank suggested some people who might contribute to the newsletter. We contacted them and I'm pleased to inform you that they graciously agreed to share some of their knowledge and expertise with us via regular articles in the LCN. The first column premiers in this issue, while the other will premier in the January issue. So how many people read the LCN? To answer this question we placed a counter on the November issue. This indicates that so far, about 500 visitors dropped by. The great majority of the subscribers are learning-assistance professionals and administrators from colleges and universities across the US and Canada. If you are interested in sharing your knowledge and expertise with these readers, send us your contributions. Click here for submission guidelines. The LCN is a free newsletter and all articles are written by volunteers. If you enjoy the newsletter, please forward its web address to a colleague that might benefit from it. Better yet, send it to ALL the colleagues you know as a holiday gift J. We appreciate your continued support. Hope you enjoy the new issue. It is sad but true that most faculty do not know that a learning support center exists on their campus and that student retention, satisfaction, and course success can be increased by partnering with it. To publicize your center and its programs and activities to faculty, visit with department heads and discuss your center's programs and services. Request that you or a member of your staff be allowed to meet with faculty at one of its monthly meetings to acquaint its faculty with your programs and services. When you are scheduled to present at a department meeting, take with you center materials, such as brochures, workshop schedules, bookmarks, and referral slips that describe your programs and services. Invite faculty to tour the center. Invite them also to meet with you individually to discuss how the center can partner with them either through in-class presentations, student referrals, or publicizing center workshops. Most importantly, remember to send an official thank you to the department as soon as possible after the meeting. Keep a record of your requests, presentations, and follow-up actions. Your goal, each semester, is to present to at least three departments. Michael received his doctorate from the University of Maryland in English Romantic Literature in 1970. His dissertation was on Samuel Taylor Coleridge's vision of women and love. After graduating, Mike was saved from a traditional career teaching composition and literature by two factors: market for literature professors dropped below zero and four years of teaching adult students at the University of Maryland's University College. The first factor led Mike to a dead end job in South Carolina, the second led him to take adult education courses at the U. of South Carolina. By a fortunate accident, Mike met Lila Bruckner, one of the first people in the country to teach graduate courses in teaching reading skills to college students. Mike met Lila while walking down the street in Columbia, SC, just after learning that the adult ed class he was going to take had been cancelled. He took her reading class instead and never looked back. Michael took over the English Language Skills Lab (the reading and basic writing program) at West Virginia State College in 1976 and moved on to direction of the Transitional Studies (reading, tutoring, English-as-a-second-language) program at Indiana University - Purdue University Fort Wayne. He was the program's first director and changed the program from a two-person operation to one with five full time staff, about 10 part-timers, and approximately 30 student tutors. With Mike's leadership, the English Language Skills Lab evolved from a one-room traditional classroom facility shared with another operation to one with three computerized classrooms, a learning center and individual offices for all full-time staff. Those of you from CRLA know Mike well, as he is very active in this organization. Mike looks fondly at his relationship with the CRLA. "One of the first important things I did was to become a member of CRLA, which has really helped me with new ideas and opportunities to bounce my ideas off people with real expertise in reading and learning assistance. The highlight of my professional career was my election to head this organization." Through the years, Dr. O'Hear has had over 100 publications and conference presentations. He believes that his greatest contribution has been that he has always wanted to try new techniques and approaches to learning and have tried to encourage others to do the same. Mike has been married for 33 years and has three children -- and is about to become a grandfather for the first time. Although he has recently retired, he is exploring a new career: teaching detective and mystery fiction over the Internet and trying new approaches to teaching first-year composition. His chief interests are mystery stories and the American Civil War. Mike and his wife are serious hikers who are over half way toward their goal of hiking in all the national parks in the US. Congratulations Mike on all your accomplishments and thanks for being our December's Person of the Month. Track students' visits, with the ability to enter comments on each visit. Track usage of services, including headcounts and total contact hours. Track staff work-hours, with the ability to export this data for payroll processing. Manage appointments between staff and students. This includes matching students to available staff, tracking no-shows, ability to send email notifications to staff and students when appointments are set or canceled, and graphical monthly and daily appointments viewers. Track loaned materials such as videotape checkouts, with late returns reports. Collect feedback and comments from visitors on the quality of services received. Analyze traffic and visits patterns via informative charts that show you busiest time of the day, most used services, returns distributions, and more. Track visitors' demographics such as year in college, etc. Send messages and announcements to your students and staff. Generate over 20 powerful reports on attendance, appointments, demographics, staff schedules, etc., with the ability to export data to other applications like Excel. Of course, the best way to learn about the software is to try it out yourself. The above web site will show you how to get your free evaluation copy to test at your learning center. The Graduate Record Examination (GRE) is required by most US universities for admission into graduate school. The test is administered by the Educational Testing Service (ETS), a non-profit organization that generates about half a billion dollars in revenues every year from administering over 11 million tests including the GRE, SAT, GMAT, TOEFL, and PRAXIS. Verbal: 30 questions in a 30-minute period. Quantitative: 28 questions in a 45-minute period. Analytical: 35 questions in a 60-minute period. The Verbal section is basically a vocabulary and reading test. The Quantitative section is a math test. The Analytical section is a logic or puzzles type of test. The range of scores for each section is from 200 to 800. Some schools only consider scores in the first two sections as an admission criteria. The GRE may also include an Experimental section and a Research section. These sections are NOT scored and can be Verbal, Quantitative, or Analytical. ETS uses these sections for testing future questions. Testers may not be able to identify the Experimental section from the scored one. If it is included in the test, the research section will be identified as an unscored section and will show up as the last section on the exam. The GRE has evolved from the traditional fill-in the circle, paper- and- pencil exam, to what the ETS describes as a "computer-adaptive" test - also called the GRE CAT. The computer selects each question depending on how the previous one was answered. If the answer is correct, the difficulty level increases, otherwise it decreases. This goes on until the computer "zooms in" to the final score. The computerized test offers some benefits including immediate feedback with the computer grading and announcing test results to takers on the spot. Also with the computerized test ETS is able to offer the exam almost daily at testing centers around the world. To prepare for the GRE, students should take a practice test to get them familiar with the computerized format. The ETS offers a software package called "PowerPrep" that includes two computer-adaptive tests with immediate scoring. The package also includes practice questions taken directly from previously administered GRE tests, with an explanation of the answers. The PowerPrep software costs $45 and can be downloaded from the ETS site. To prepare for the Verbal section, students should work on their vocabulary skills. Capital Community College has a good web site on the subject called Building a Better Vocabulary. The site includes sections on common Greek and Latin word roots, Prefixes and Suffixes, a pop-up lexicon with 365 SAT- and GRE-level vocabulary words, fifteen quizzes, and links to other vocabulary-building resources. To prepare for the Quantitative section, students need to review elementary math, algebra, geometry, and charts. Many GRE preparation books include a math review section that covers these areas. The Princeton Review publishes such a books. You can find it in your local book store. To prepare for the Analytical section, students need to practice solving the puzzle-type questions they will encounter in the exam. As mentioned above, not all programs take the Analytical section score into consideration. This is a busy month for holidays. Whether your relatives, friends, or colleagues are celebrating Christmas, Ramadan, or Hanukkah you can send them a holiday greeting via Blue Mountain. The electronic card will arrive to their email box within minutes, and you don't have to worry about postal delays or long lines. Blue Mountain also offers a large collection of birthday cards. These include interactive cards using Flash technology, belated birthday, family birthdays, invites, and more. These cards come to life with text, images, animation, and music. Is your PC showing the correct time? Would you like to have its clock set to a fraction of a second accuracy? There is a small program that can help you do just that. WebTime is a free small utility for Windows 95/NT that will synchronize your computer’s internal real time clock with any one of several atomic clocks maintained by the United States National Institute of Standards and Technology. This utility uses your web connection for the synchronization. The program is simple and easy to use, and can even set itself up so it automatically runs whenever Windows is started. And with the "auto" command line switch, you can set it up to run automatically and synchronize your clock every time you start Windows. Do the colors on your computer screen look hazy? Do you have a small screen area that does not allow you to see much of your applications? A simple change in your screen settings might help with both cases. Start by checking the colors settings in the "Colors" box. If the selected value is "16 colors" or "256" colors, high color images will not look right. To change this setting, simply use the drop-down list to select "High Color" or "True Color" from the list. If the list in the "Color" box only has 16 colors in it, then you are either have an old graphics card that does not support higher colors, or your computer does not have the correct driver for its graphics card. Your IT support can help you investigate this further. Note that there is a trade-off between using low color and high ones. 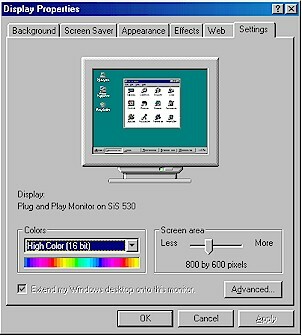 The fewer colors Windows uses, the faster images appear on screen. However, with only 16 colors available, you'll end up with mottled images. For more realistic images, you will need High Color, a palette of more than 65,000 colors. True Color allows for about 16.8 million colors. To change your setting, select a new one and click OK. Some graphics cards will require that you restart Windows before the new settings take place. Others will do the change on the fly and you'll see the results immediately. To find out what screen area your computer is using, check the screen area tab. The least screen area you can have is 640*480, which is appropriate if you are using a small monitor. If you are using a 17" monitor or larger, a higher screen area would provide more room on your screen. This means you will see more of your document or web browser window, and you can comfortably tile more than one application on the screen. However, a larger screen area means smaller font and buttons. This is why a bigger monitor would help. To change to a larger screen, simply move the slider to the right. To see how your screen looks like after the change, click on "Apply". Again, some graphics cards may require that you restart the computer for the new settings to take effect. Others will switch the area on the fly. If you don't like the new setting you can revert back to the old one. Try different screen sizes until you find one the suites you best. Note: The maximum screen area is a function of your display card and monitor. Older cards and monitors may not allow higher screen area. Also if the memory on your display card is small, the card will not allow both higher area and true color at the same time. Don't laugh... your daughter maybe in here! Ask me about microwaving cats for fun & profit. If you are psychic - think "HONK". "Life is a succession of making choices and education will help you make wise ones." "That which we are, we are all the while teaching, not voluntarily, but involuntarily." The newsletter is usually released during the first week of each month. For an article to appear in a certain month, it should be received by the 25th of the previous month. For example, the January issue articles need to be received by December 25. By submitting articles, you give us the right to publish and to edit them if needed. This newsletter is produced by Mon Nasser from Engineerica Systems, Inc. My thanks to this month's contributors: Frank Christ, Lucy MacDonald, and Mike O'Hear, our December's Person of the Month. A management tips from Frank Christ on using bookmarks to maintain program visibility. Gen Ramirez, our November Person of the Month. First Annual Learning Center Awards announcement. Blackboard.com, an online course creation site. Software for improving your typing skills. Quotes by Dale Carnegie, Indira Gandhi, Mother Theresa, Disney, and others. Note that the process of tracking members and emailing them is currently a manual one. When you send email to subscribe or unsubscribe it will be read and processed by humans. As the subscriber base grows, we might switch to an automated system. Let us know if you know of a good site or software for automating this process.